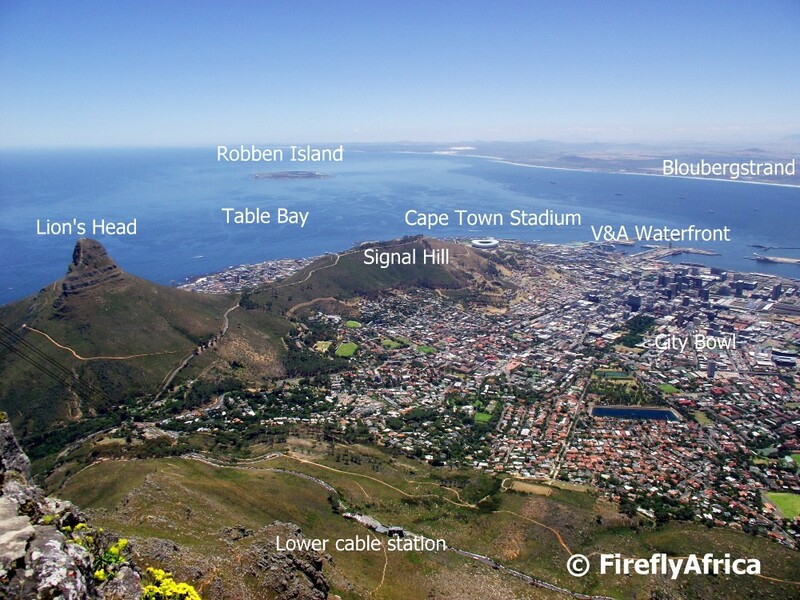 The view from the top of Table Mountain must be one of the most beautiful city views in the world with Cape Town at your feet and stretching away in the distance to the right and Table Bay and the Atlantic Ocean azure blue on the left. I've pointed out a couple of Cape Town's main landmarks as seen from one of the lookouts on top of Table Mountain. 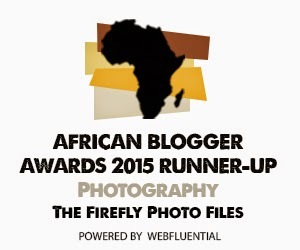 I will still follow this post up with a post discribing our visit to Table Mountain. 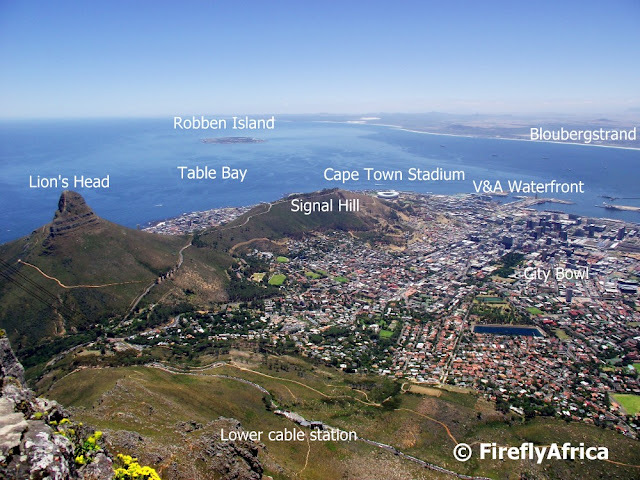 Our trip up Table Mountain was sponsored by Table Mountain Aerial Cableway. 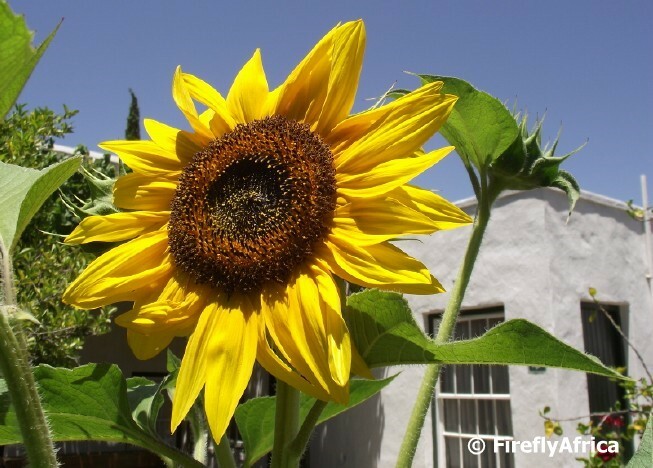 While exploring the town of Montagu in the Western Cape I discovered the Montagu Nature Garden on the outskirts of town. I wouldn't really call it a garden, but rather a nature reserve as it covers quite a big area. 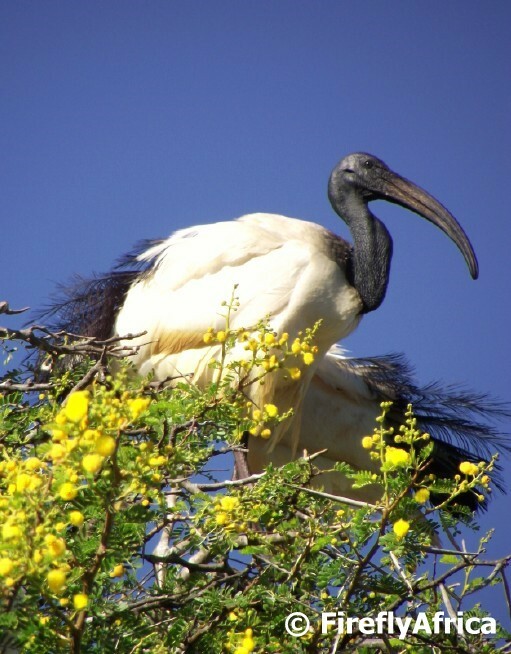 The Montagu Nature Garden was established in 1954, the year that Montagu celebrated its centenary. Montagu Nature garden is situated in the most southerly part of the succulent Karoo “biome.” It has the distinction therefore of having flora of 3 regions of the Western Cape – succulent karoo, fynbos and renoster veld. 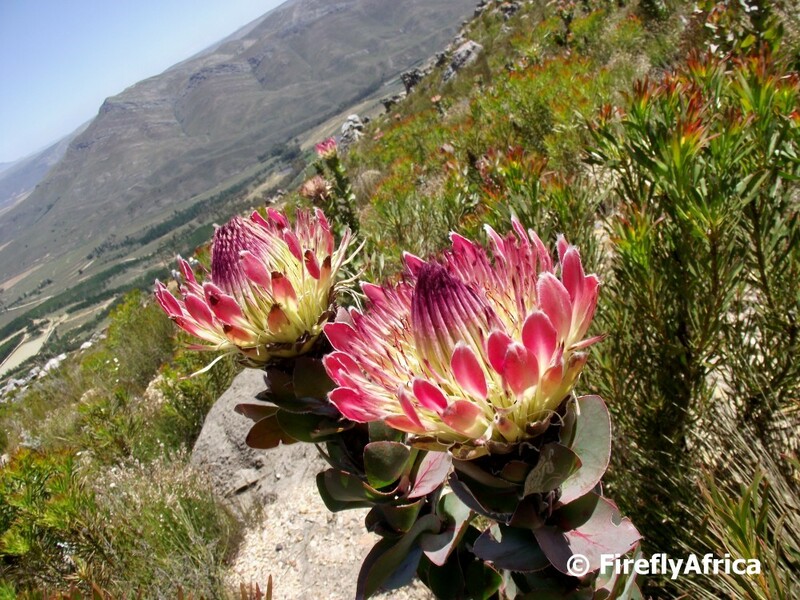 Although you can visit the reserve at any time, the best would probably be in spring when the excellent variety of Vygies (mesembryathemums) are blooming and covering the reserve in a blaze of colours. 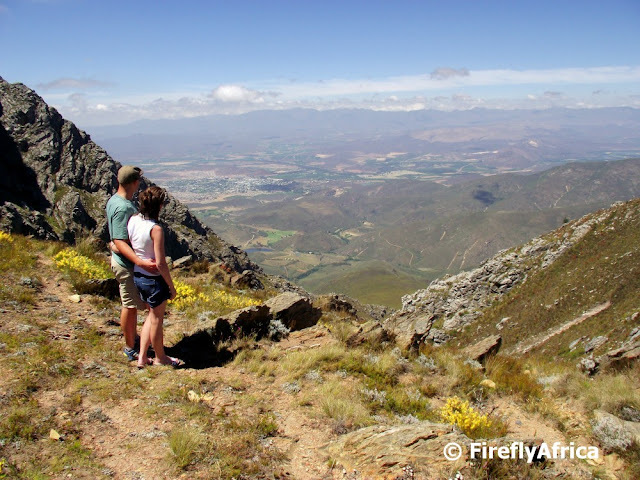 There is a 1,7km circular walking trail within the garden that takes visitors to the top of Bessiekop for a magnificent panoramic view of the town and the surrounding Cape Folded Mountains. Ours was unfortunately a hot day and the kidz were in a hurry to get back to the caravan park and into the pool so I didn't get to the the whole walk. Next time, I promise. At the end of the walk there is a dam with a stream and lush lawns which provide a welcome break after the walk. 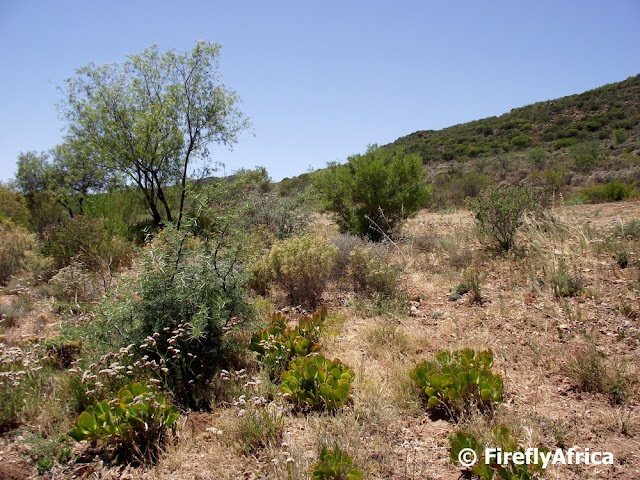 It kinda looked out of place compared to the rest of the reserve, but the area is well known for its abundance of water in the dry Klein Karoo. 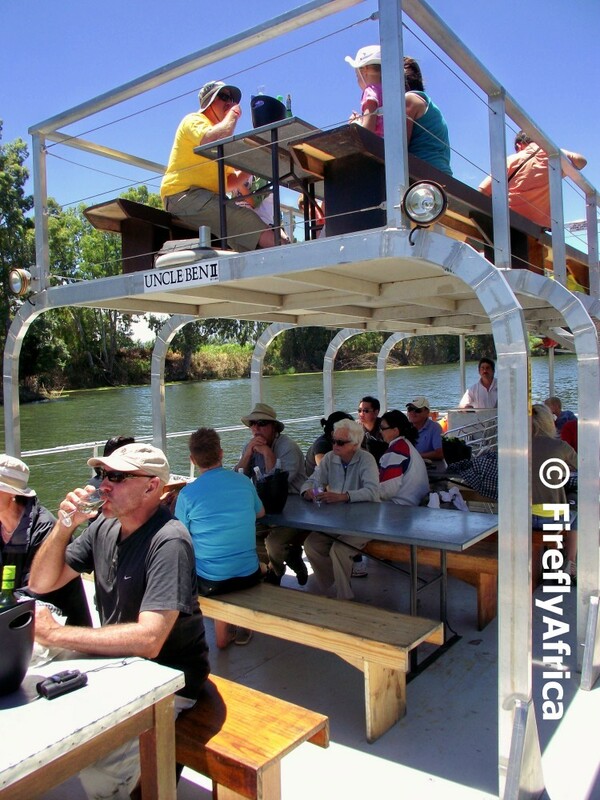 There is probably no better way to enjoy the Viljoensdrift wines than leisurely cruising along the Breede River on a sunny day. 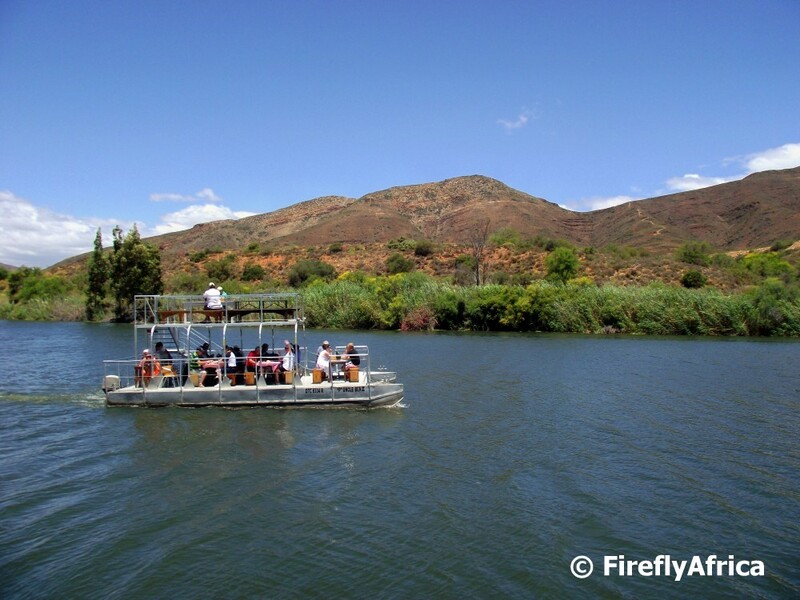 The Viljoensdrift wine estate offers one hour cruises up and down the river from their shop and tasting area on the farm and although we're not wine lovers (and you don't have to actually drink wine to go on the cruise), we decided to go for the outing. The boat seats about 40 people and most of our fellow passengers bought wine from the estate before the cruise to take along. Ours was a nice hot sunny day with no wind and it was ideal for cruising. Just to show how laid back it was, Chaos Boy who doesn't sit still for long on the best of days were up and down the steps and literally hung from the rafters next to the boat's captain... and nobody even batted a eye lit. I think the most innovative idea that goes along with the cruise is the fact that passengers get given a "Create a picnic basket" menu containing items from the deli on check-in at the wine estate. 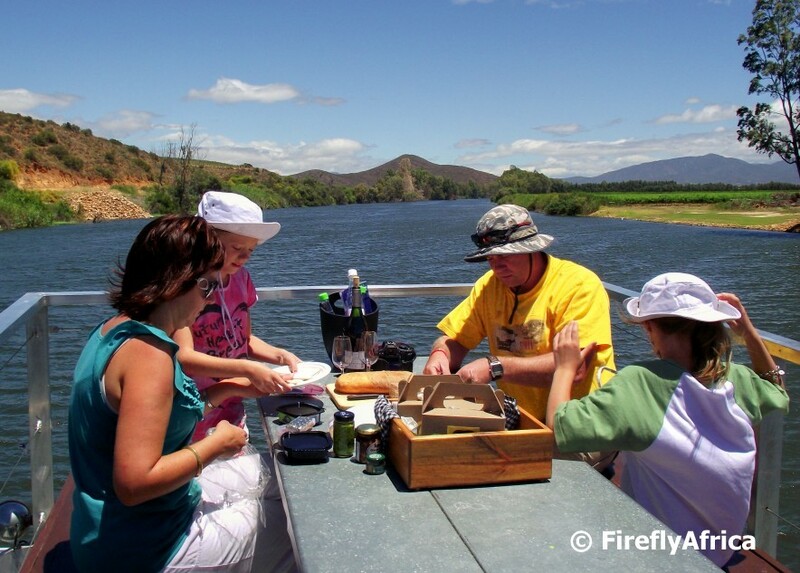 As you board you get given your picnic basket and wine to take on board. As we were going for lunch after the cruise we didn't order anything to eat, but the family next to us did I got the opportunity to take a snap of them tucking in. 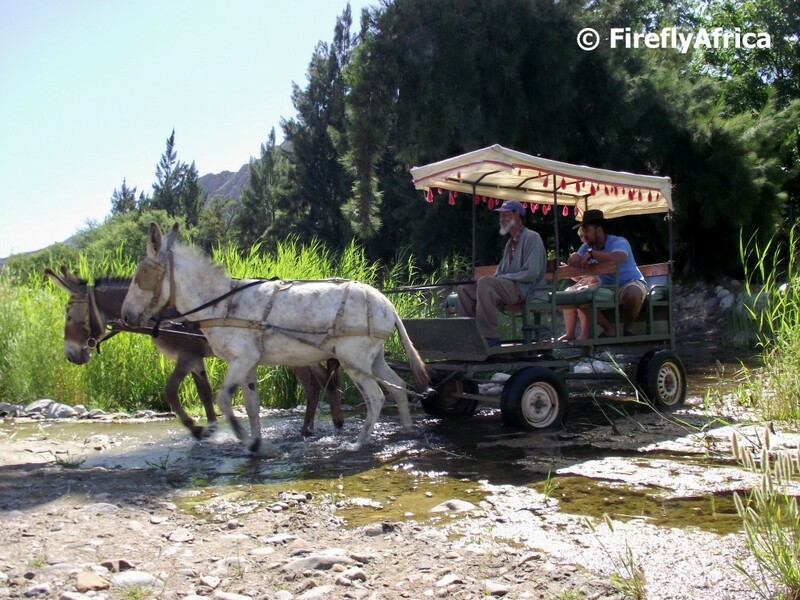 While visiting the town of Montagu we didn't really venture through Cogmanskloof into the Robertson Valley area and rather explored our immediate surroundings. 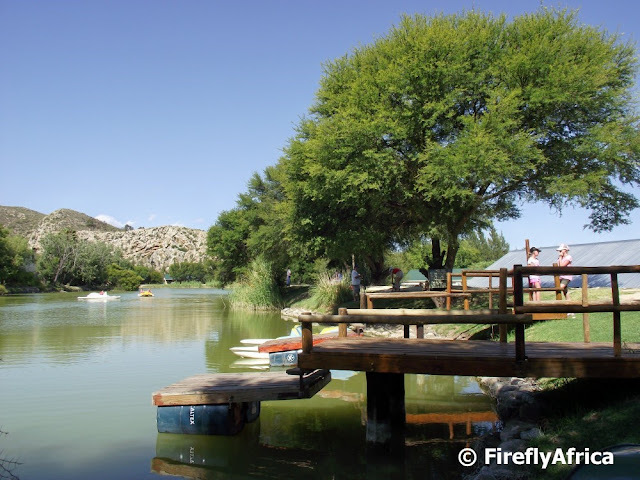 One morning we did decided to venture through the kloof with our camping neighbours and ended up at Viljoensdrift Wine Estate near Bonneyvale for a river cruise on the Breede River. 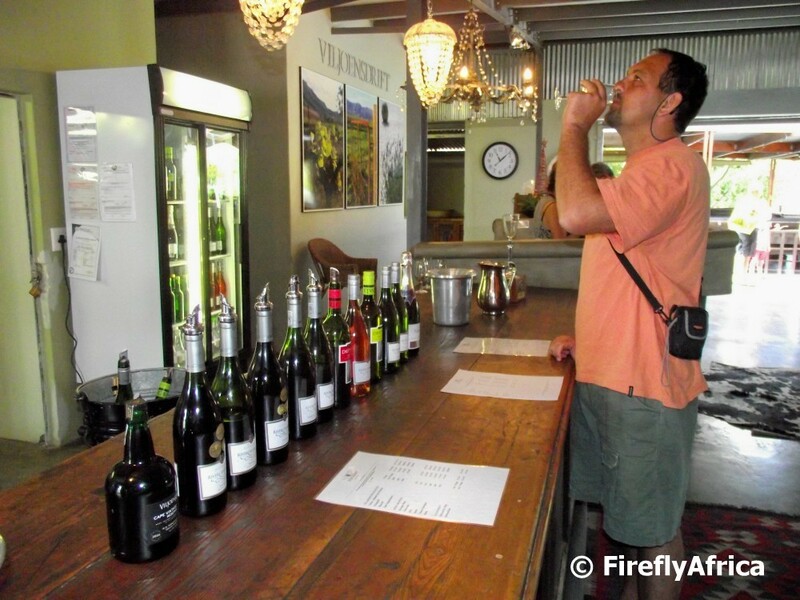 We had about an hour or so to wait (or waste, which ever word rocks your boat) before the cruise departed so while the women and children sat out on the deck, Bertie (the neighbour) and myself decided to have a closer look at the wines that the estate has on offer. 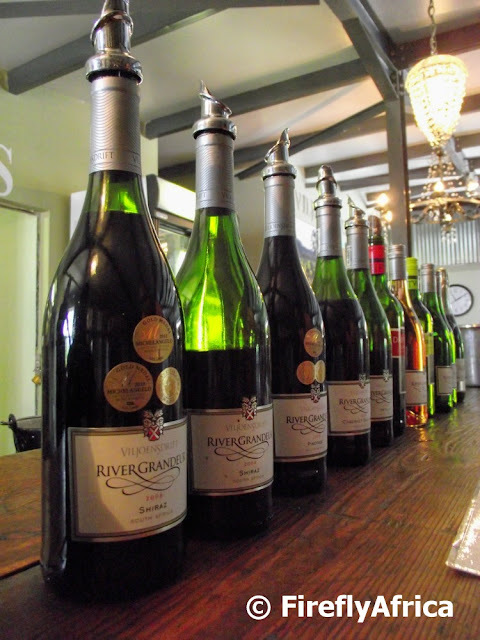 I'm not a big wine drinker, not by a long shot, but I really enjoy wine tastings. Sometimes I can pick up the fruity (or chocolate or chili or whatever else) fragrances and tastes that they say you are supposed to taste in your mouth, but being somebody who prefers a sweet wine I often just try not too pull my face. Viljoensdrift has a couple of very nice wines with my favorite being, surprise surprise, their dessert wine. 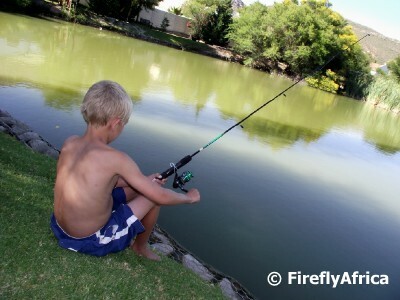 In the post about Montagu Caravan Park I mentioned that the caravan park has a dam that is a very popular fishing spot with the campers. 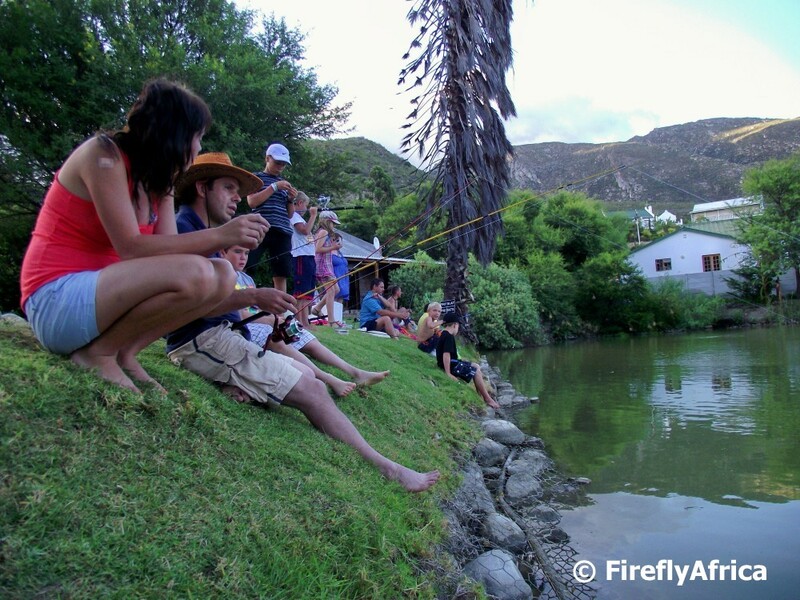 At times the kids (and adults) were lined up next to the dam casting and reeling in. Now I'm not a big fisherman. I enjoying doing it for 15 or 20 minutes and then I get bored, so I don't really have the patience to be a fisherman. I'll rather sit and watch animals in the wild or go for a walk somewhere with my camera in my hand. The Kidz on the other hand headed up to the dam every day and luckily there were two dads (and one mom) who took them under their wings as far as the fishing went and helped them out with the rods we rented from the park shop. 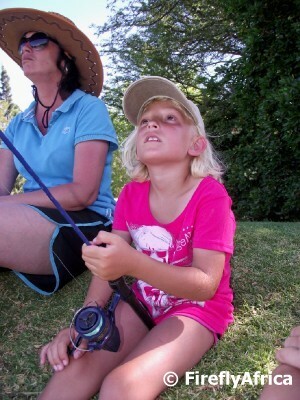 Drama Princess literally spent hours sitting by the water watching people fish and couldn't wait to get her hands on a fishing rod. She actually did very well and hooked quite a few which the adults then helped her to bring in and take the hook out. As soon as the hooks were out she would grab the fish (if I was there she would pose for a photo) and then go and release it very gently. 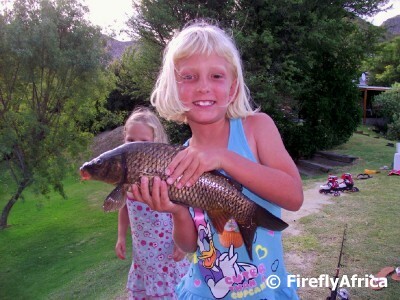 The one day her fish (in picture) was probably the biggest one caught that day. 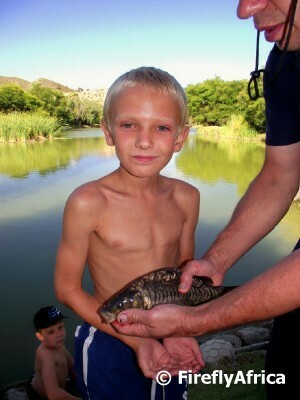 Chaos Boy on the other hand gets bored and distracted very quickly and I didn't think he would enjoy fishing. He did try it a couple of times but couldn't really sit and wait. He would cast and reel in, cast and reel in. Perhaps he should try fly fishing. He did catch one or two fish when he did sit still for longer than 5 seconds, but he wasn't keen at all to actually touch the fish and somebody had to hold the fish for him so that I could take a photo. Over the last five years we have developed into a real camping family. Camping allows us to get out into nature more than we would staying in an hotel or guesthouse and because its cheaper it also allows us to have longer holidays. When we started camping we decided to always try out new places and in that way get to see more destinations and areas around out beautiful country. 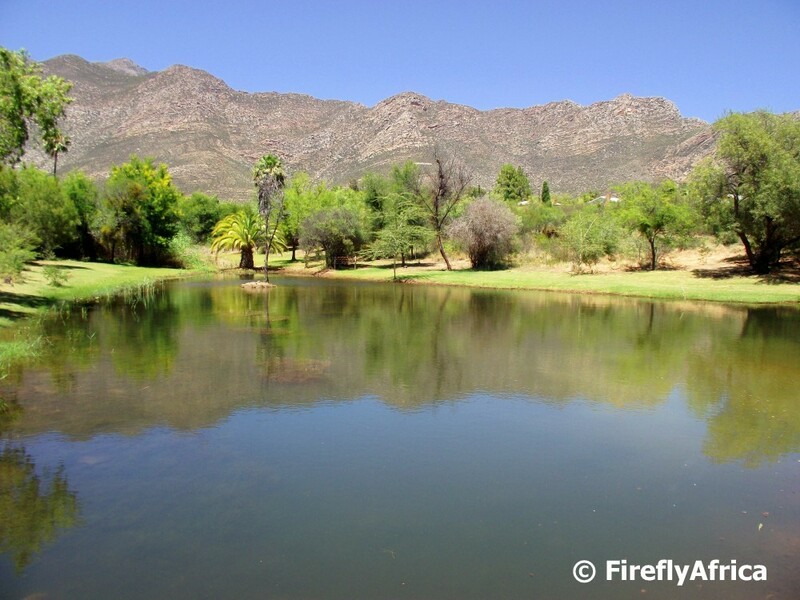 The Damselfly decided to book us for 10 days at the Montagu Caravan Park in the small Klein Karoo town of Montagu over Christmas 2011. 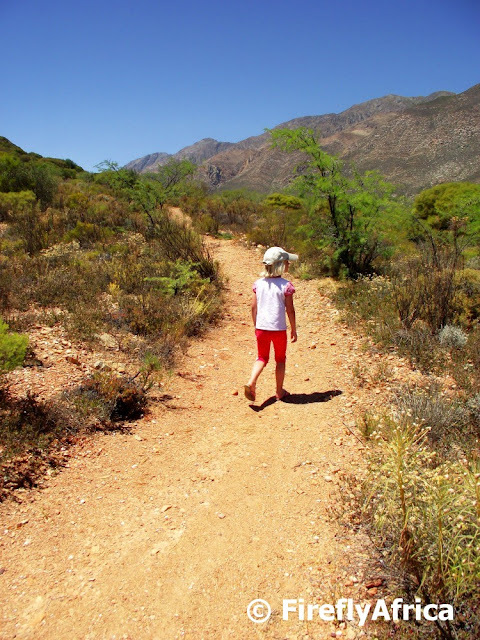 At first I tried to figure out what we would do there for 10 days, but by the time we left Montagu I actually said that I would move there any time. But I digress. 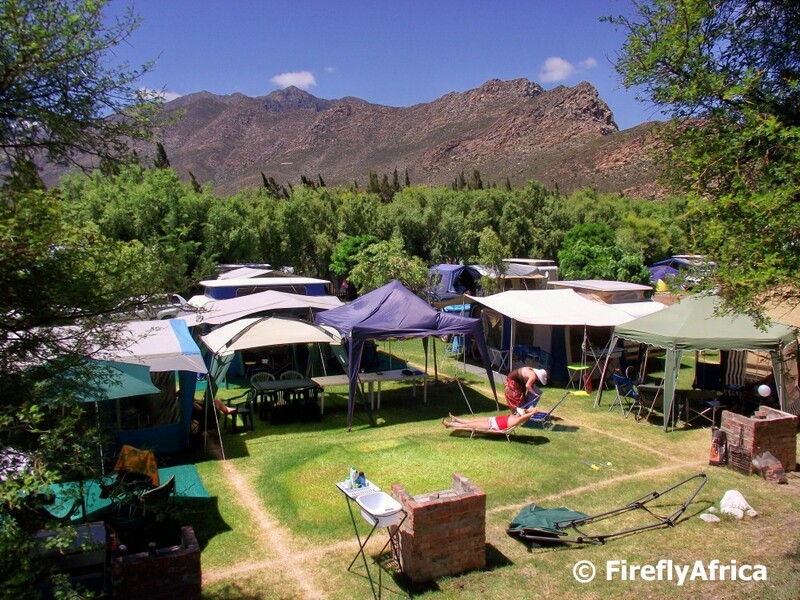 The Montagu Caravan Park with its 56 stands was a huge surprise. Iain and his team runs the place like a Swiss clock, perfect and with precision. The moment somebody moves off a sight they descend on it to trim the grass and get the sprayers on. So its no wonder that the sites are all covered in lush green grass. The ablution blocks, of which there are more than enough of, are always clean and there are two swimming pools to cool down during those hot Klein Karoo summer days. One of the main features of the caravan park is the dam. At one stage or another most visitors end up either taking the paddle boats out or spend some time on the banks fishing. The kidz have never fished before in their lives (perhaps because I don't have the patience for it), but some of the other dads took them under their wings and they both really enjoyed it. Even caught some fish, but that's a whole other post. 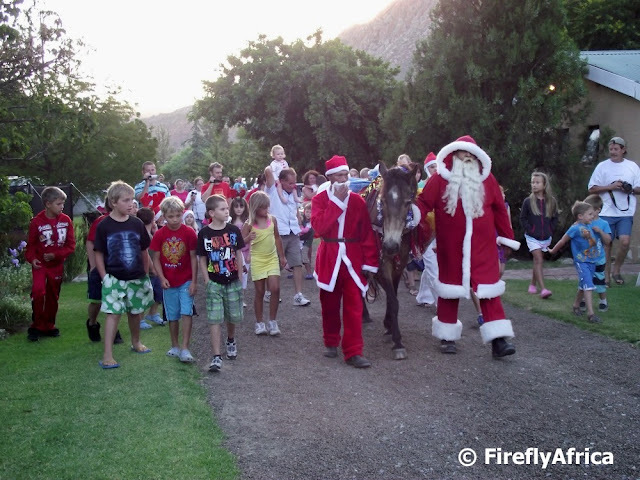 Like a lot of family caravan parks they also had a number of activities over the Christmas season and the highlight was the arrival of Father Christmas, his assistant and a horse laden with gifts on Christmas eve. Father Christmas first did a walk about through the whole caravan park and the further he went the bigger the following crowd got before handing the gifts out to the kids in the park's hall. 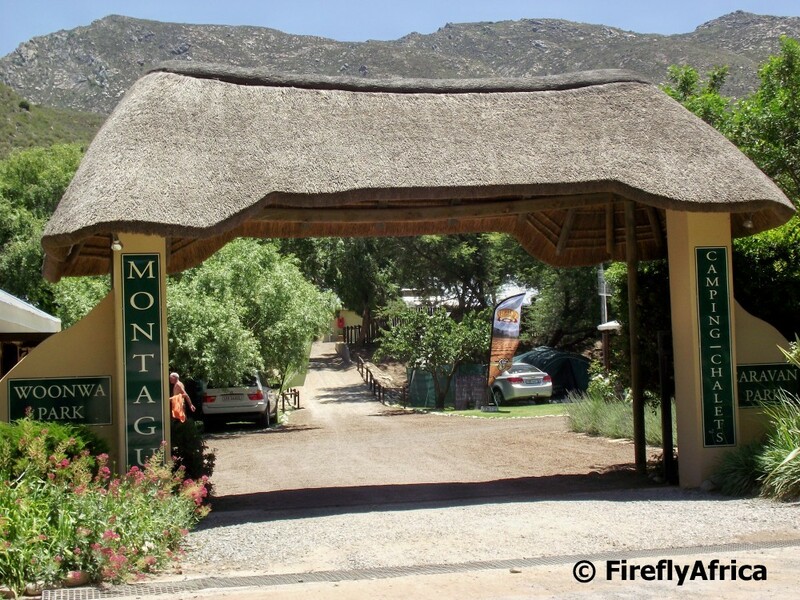 We really enjoyed staying at Montagu Caravan Park and I can without a doubt recommend it. In actual fact we are considering breaking our rule and going back there this year. 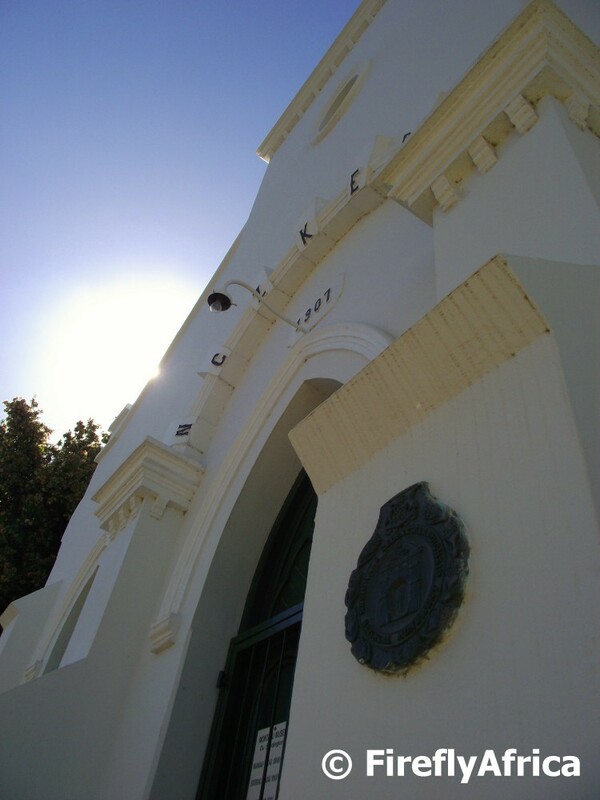 The ride took us through town and past some of the historic landmarks like Joubert House and the Dutch Reformed Church. Although the driver isn't a tour guide, he still told us all about what we were seeing plus its always nive chatting to locals. 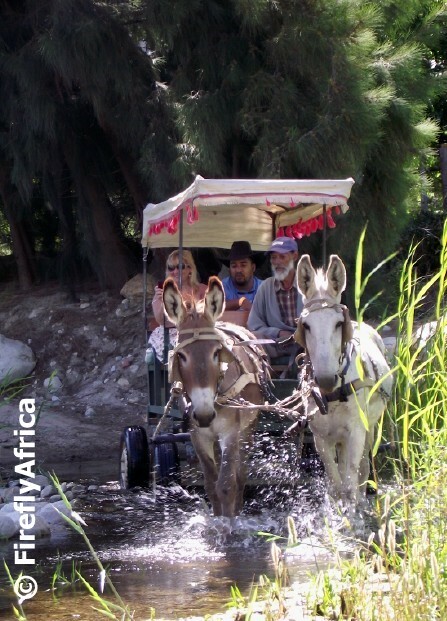 Every now and then the donkeys, named Whiskey and Soda, stopped and had to be encouraged to get going again. Makes you understand where the saying "As stubborn as a donkey" comes from. The second part of the trip took us along a dirt road and we crossed a stream a couple of times. The next day on my way back from the shop I passed Whiskey and Soda along the road and decided to go ahead to one of those river crossings and wait for them. 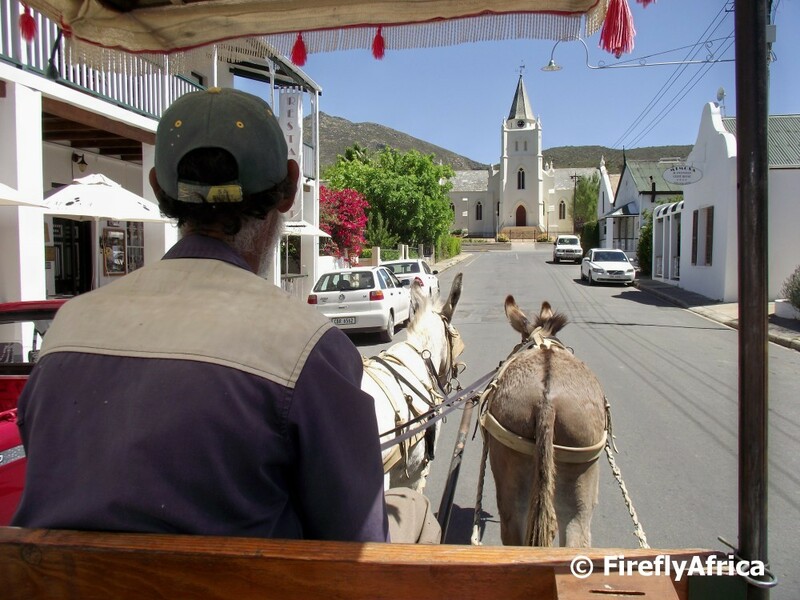 A trip like this really makes you take in the scenery so much more than you do driving in a car and is the ideal way to really explore a small town better. 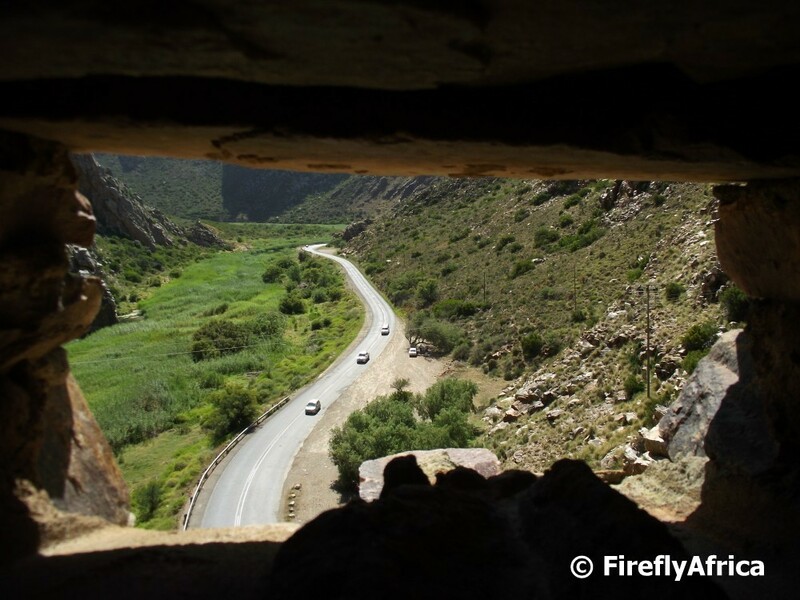 When you mention Montagu to somebody who has passed through the area before, one of the first things that will pop into their heads will be Cogmans Kloof and the tunnel through the rocks. Cogmans Kloof is often seen as the gateway to the Klein Karoo and runs through a gorge with some of the most amazing geological features in the Western Cape. The original route through the mountain included two fairly dangerous river crossings. Famed road and pass builder Thomas Bain was commissioned to build the pass through Cogmans Kloof in 1877 and blasted the tunnel through in 1879. 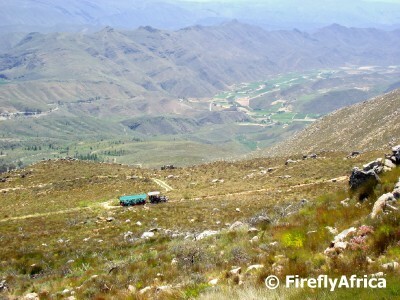 On top of the tunnel stands an old English fort built in 1899 during the Anglo Boer War. 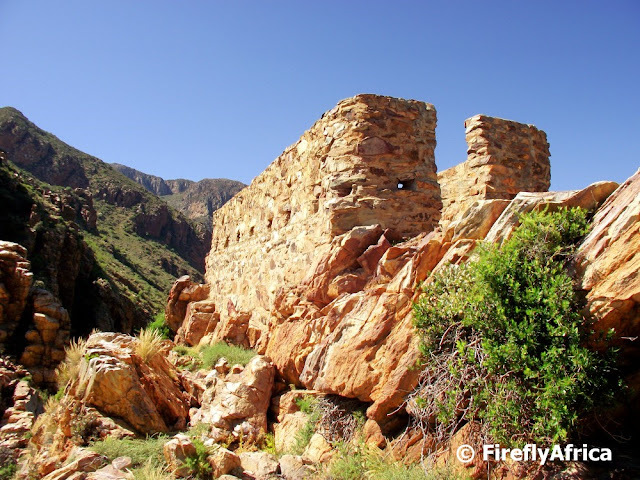 I have seen the fort whenever I passed through Cogmans Kloof, but I've never been up to it. 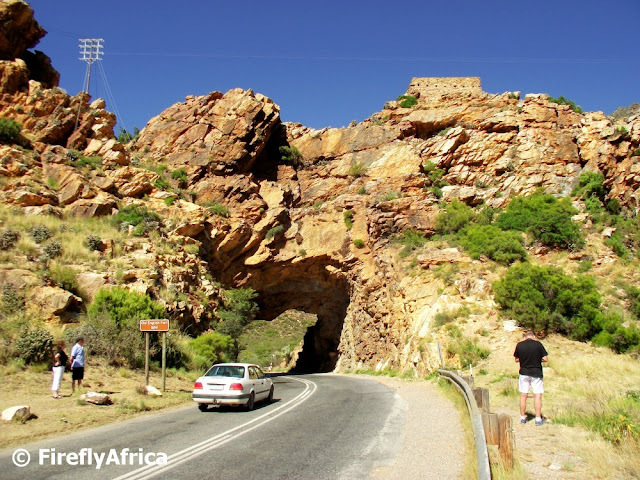 During our visit to Montagu I drove to the tunnel one morning and as I stopped I saw a couple of guys climb up to the top. I was kinda wondering how to get up to the top and this answered my question. Huffing and puffing I made my way to the top, even tearing my pants sliding over a rock, but I made it. The fort has an awesome view and you can see why it was built there in the first place. The Montagu Tractor Trip, one of the premier activities to do when visiting the Klein Karoo town of Montagu, takes place on a farm called Protea Farm about 35 km out of town. When we arrived at the farm I didn't really notice any proteas, but as we travelled up the mountain they started to appear in the surrounding vegetation. 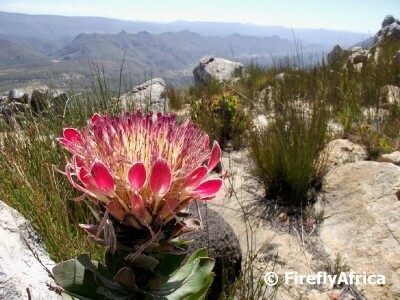 The surrounding mountains and valley made for some excellent backgrounds to photographing these proteas. 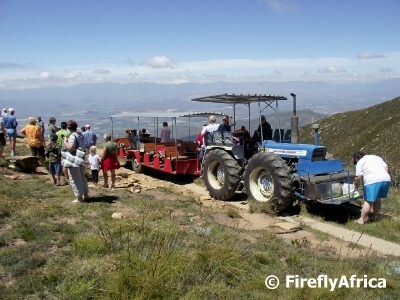 The very first thing we looked up and booked when we decided to go to Montagu was the legendary Montagu Tractor Trip. 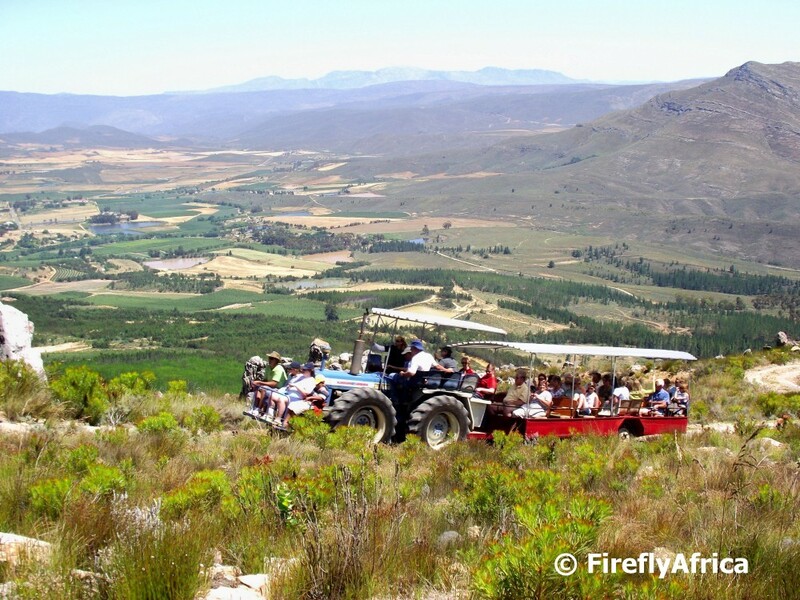 "What makes a tractor trip so special?" you ask. Well, this isn't just any old tractor trip. 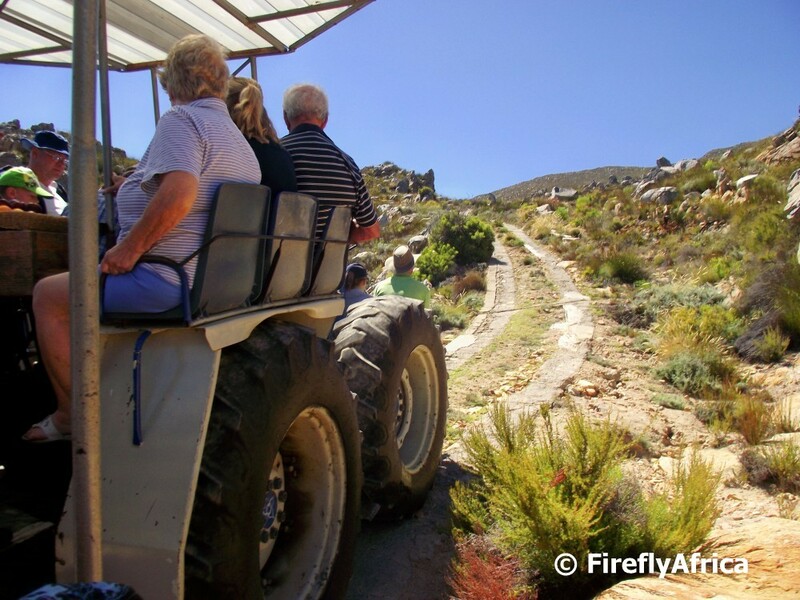 The trip takes place on Protea Farm about 35 kilometers outside Montagu and was started in 1985. 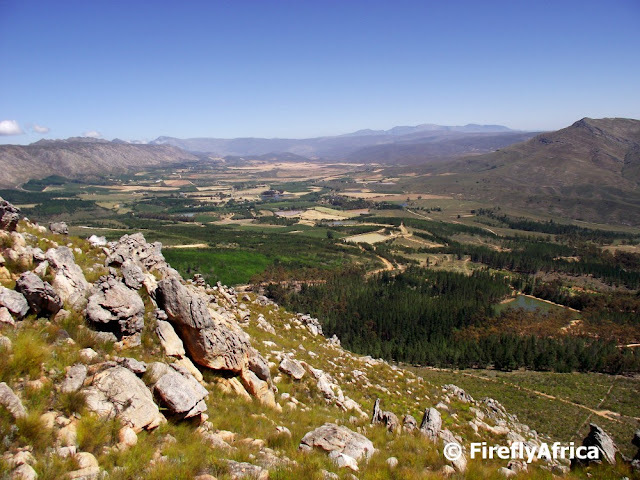 The tour meanders it's way up the Langeberg Mountain to an altitude of 1500m above see level with some of the most breathtaking views you can imagine. We made our booking for the morning trip and made sure we were there nice and early. Each tractor and trailer takes about 45 people and on the day we were there they had 90 people booked. The best seat in the house is the one on the front of the tractor although it really doesn't matter where you sit as the whole experience just rolls out all around you. Niel, who started the tours in 1985, and his son Pierre drives the two tractors themselves and expertly (you can see they've done it a couple of times already) navigates them up the the winding track. The higher we went up the mountain the better the view got. Its one of those trips where you keep on taking photos because you don't think it can get any better, but it does. Better and better. The Koo Valley to the west opened up below us and we litterally had a bird's eye view all around. On the way up the tractor stopped a couple of times to us the opportunity to hop off and enjoy the view while taking a couple of pictures. Those with a bit too much energy who felt like stretching their legs could walk up ahead and got picked up by the tractor a bit later on again. Right at the top we stopped at a mountain hut where we had a snack of Muscadel (sweet dessert wine) and dried fruit before heading on again. The best view is kept for last when you get to the turning point at the top. Opening up on the other side of the mountain and stretching away below is the Robertson Valley. Wow! Now imagine doing this trip in the winter when the top of the mountain is covered in snow... That would be like double wow! This truly should be on every traveller's list of South African things to do just like going up Table Mountain or travelling down the Garden Route. 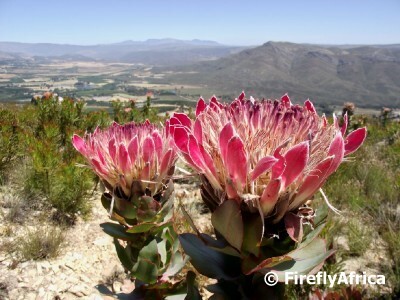 We visited Protea Farm at our own expense. 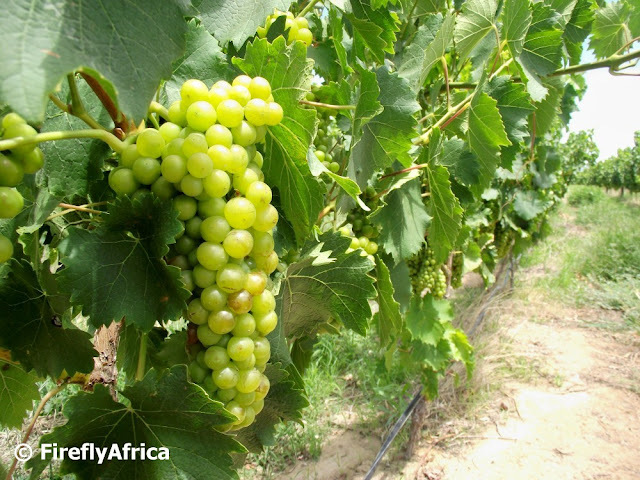 Protea Farm's contact details for more infomation.